Dave’s Muffler provides dependable auto repair services at prices you’ll be happy with. Our ASE certified technicians will get your car up and running after a mechanical failure and can provide regular auto maintenance to keep your vehicle running smoothly for years to come. We also take care of wheel alignments with our Hunter Laser Alignment equipment that can be used for many types of vehicles including cube trucks, limousines, and most short buses. Our large inventory increases the speed of service. Our skilled mechanics will work through any problem, big or small, quickly, without sacrificing quality. Many of our repair services can be done in the same day. If your car needs extensive repairs lasting multiple days, we will provide you with a free loaner car. Dave’s Muffler provides 24-hour emergency roadside assistance. Don’t let unexpected problems leave you stranded – get in touch with us now! Call (262)-656-1017. Our staff is trained, knowledgeable, and ready to get your vehicle repairs taken care of, quickly. We pride ourselves on providing customers with upfront pricing, flexible service, and top notch customer care. Since 1989, our shop has been helping vehicles run smoother and stay on the road longer. Vehicle safety is of the highest priority at Dave’s Muffler. If you have a dashboard warning light on or hear an irregular noise coming from under your hood, stop by Dave’s and we’ll take a look. Quality service and savings has always been an important part of our business. Regular auto maintenance and repairs are a natural part of owning a car. 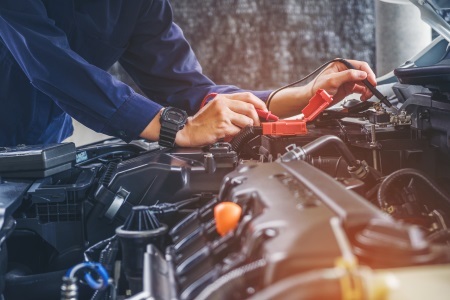 While there are things you can do to prevent normal wear and tear on your vehicle, there will come a time when you’ll need to hand it over to a trusted mechanic in order to keep it running safely and efficiently without breaking the bank. Let Dave’s Muffler be your one stop shop for all vehicle repair services. Is your vehicle making a weird noise or have a strange smell? Maybe you’re having trouble getting the car started, or the screeching when you brake keeps getting louder and louder. There are hundreds of components, small and large, that keep your vehicle running smoothly. If even one part starts to malfunction or has failed completely, there will likely be symptoms of a problem. Whether the issue is small, like your truck pulling to the side even when your steering wheel is straight; or big, like smoke pouring out the back of your car, it shouldn’t be ignored. Dave’s Muffler in Kenosha is an incredible choice for inspection and diagnosis of your car problems. Our mechanics will fix the problem in no time. Contact Dave’s Muffler for all your vehicle repair and maintenance needs today!